Recognize him yet? He's the helpful character that taught a first generation of pioneers how to program computers. He never had a name, he just added humor and commentary to what is arguably one of the finest user's manuals ever written, the TRS-80 Level I User's Manual. This manual, written in 1977 by Dr. David A. Lien, was designed to handle an amazing task. Teach people how to use their new "computer" when no one knew what a computer was. It's hard to imagine, but in 1977, the TRS-80 was the first-ever computer for the public. A handful of hobbiest systems, notably running CP/M, or kit systems like the Apple-I had been out, but it took Radio Shack to try and sell a computer to John Q. Public right next to a new CB radio or 9-volt battery. Computers for everyone was a radical concept, for one big reason - there was no software. No joke, the first TRS-80 Level I 4K computer came with built-in BASIC. In fact, initially there wasn't even a cassette deck. You bought a computer that came up in BASIC when you turned it on. If you wanted to run a program, you had to write it. Then and there. Just to make it interesting, realize that no one else had a computer either. There was no one to ask questions of. Outside of a university minicomputer, no one really knew what a computer was, or what it was for. And that's where our hero comes in. The TRS-80 Level I User's Manual, after using 2 pages to explain how to set up the computer, went straight on to teach a user how to write software so it could do something. A legion of people learned to write software from this volume. The easy to read, conversational style and short, understandable examples made it possible for someone to sit down and learn to program on their own. And we do mean on their own. Computer magazines, user's groups and working code examples didn't exist yet. And rest assured, the Radio Shack staff didn't know what to do with it! Charles Petzold's Programming Windows is often cited as a masterful piece of writing, and it is. But Dr. Lien's relaxed style and bite sized samples were like potato chips. Just one wouldn't hurt, but then it worked, and the next one was only a couple more lines and, "hey, I can do that." Many times someone would flip through the manual wondering what the heck a computer was, tried the first example, and left the store at closing time. Good thing. Radio Shack didn't figure out how to market it until the Model III. "Just What Is a Computer Program? A program is a sequence of instructions that the Computer stores until we command it follow (or "execute") those instructions. 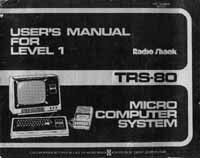 Programs for the TRS-80 are written in a language called BASIC - and that should give you and idea how easy it is to learn! 10 PRINT "HELLO THERE. I AM YOUR NEW TRS-80 MICROCOMPUTER!" Do not hit the ENTER key yet! If you made a mistake, don't worry -- it's much easier to correct typing errors on the TRS-80 than it is on a regular typewriter. No rubber erasers or white paint to fuss with! Just use the backspace key..."
Alas, even this fine volume couldn't withstand the ravages of time and the Politically Correct revolution. Well, unless there were riots outside Tandy Corp that we didn't hear about back in 1977. Most likely no women ever read the manual to be offended. Spending $500 on a glorified calculator that didn't work until you typed on it for an hour is definitely a guy thing.